We hiked 48 miles in 2 days to reach Hiker Town. Yup another water thing, got to keep going so as not to carry extra weight to dry camp. We camped that one night on this section in a dry little draw where minutes before we’d watched 2 dirt bikers in their neon plumage and plastic body armor bounding down the multiuse trails trying to get out of the canyons before dark. Looks like so much fun and it’s the perfect country for it. As night deepened, way down below in the v-notch of the canyon, brilliant yellow lights glowed from a town. Lancaster maybe? 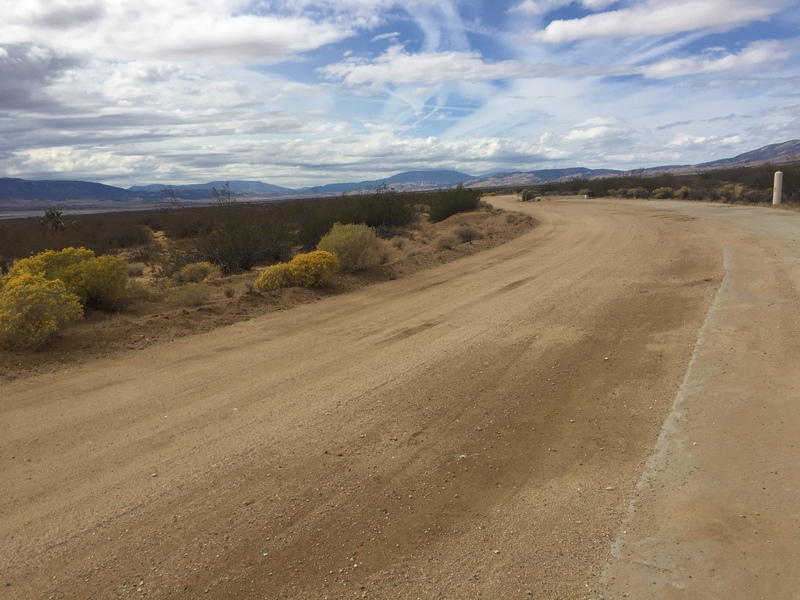 Walking down into the flats of the LA Aqueduct was sunny but cool, in contrast to the wind and heat I walked through last year. Across the valley, the next mountains we would need to climb the following day were shrouded in rain. Hmm. Hiker Town was deserted, we had the place to ourselves and slept on the couches, ran a load of laundry and Bob gave us a ride to the store/taqueria for a burger. So quiet and warm. We left before dawn and headed into the 50% chance rain and got rained on for the entire day. I believe that I hiked uphill faster than I have ever gone before! Just trying not to die of hypothermia. I watched Puff Puff’s tracks melt and wash out from the rain and little slip marks where the mud got slimy. We were both in survival mode hoping to get over the top and onto the side of the crest that was out of the weather. While the rain did let up, the trail continued in a dense wet, cold cloud. I glanced quickly at the gigantic wreck of a cistern that earned me my trail name last year but my hands were too cold to push the buttons on my phone to take a photo. I finally camped alone after 20 miles st 3:15 pm because I was sick of being wet and cold and just needed to warm up. Puff 2 continued. I told myself that I could warm up then continue on to join her, but my rain gear was soaked through and it never stopped raining and blowing as I lay comfortably in my sleeping bag, so I stayed put. Our plan was now to meet at the Rock Inn in Lake Hughes for real food the next morning. I packed up and headed out in daylight for a change, the weather having cleared up about 5 am. It was nice to be able to see the trail. 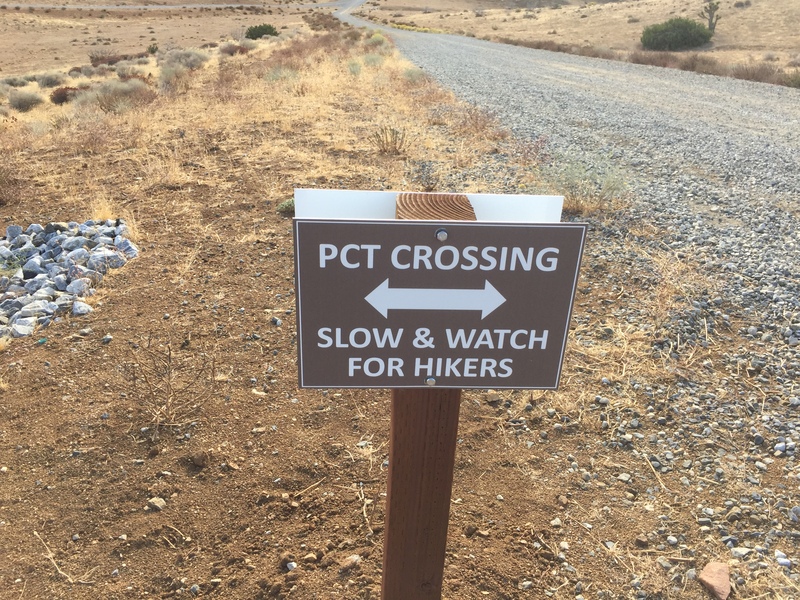 Due to a fire a few years ago, the PCT is closed for 20 miles but there is a detour down through a side trail for 5 miles, then an 11 mile paved road walk, then finally linking back to the trail. As I reached the road debating whether I should walk it or speed things up so Puff wouldn’t be waiting for hours, a truck pulled next to me to offer a ride, the guy owned the real estate office right across from the restaurant 5 miles away. Halloween trick! I accepted and walked into the Inn where Puff Puff was sipping a hot cocoa and expected her to ask how I’d caught up so quickly. In her place I would have asked. But never underestimate British reserve, culture shock to this blunt, direct American. Hours later I had to confess how I cheated! Trick or treat? That is the question, eh? 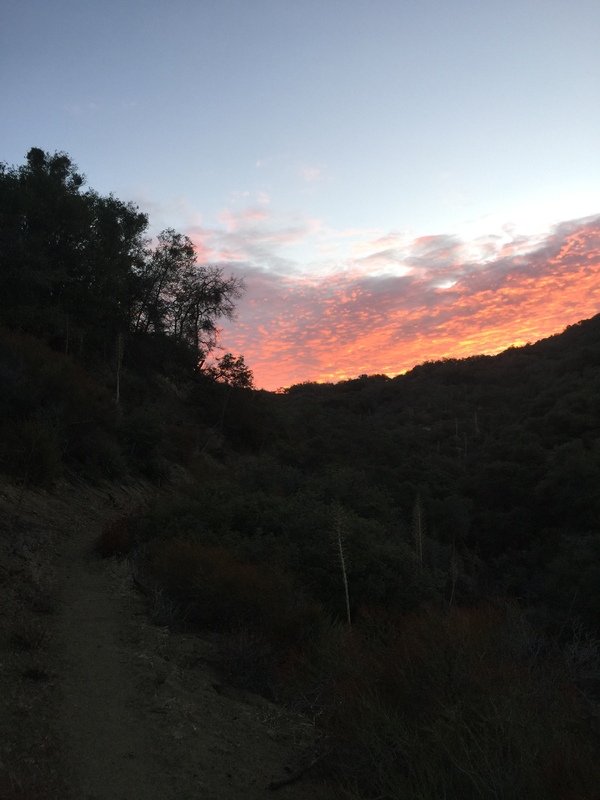 We had to miss a stay at Casa de Luna since we crossed the road near by at midday but we camped at the old cache site under the mesquite and walked into Agua Dulce for a night at Hiker Heaven. Oh comfort and joy! Just 4 of us SOBOs, all women and volunteer caretaker Country Gold from North Carolina. There’s another closure ahead so we have a ride arranged. This year I’ve not been giving you the PCT mileposts in the blog titles. Rather I’ve been more or less calling it out by naming the resupply points or town spots. So it is somewhat out of blog character to say I’ve got less than 500 miles to hike. And I’m gleeful about that. Not too many years ago, 500 miles of hiking was a goal, a challenge, a dream. Now it’s a countdown. If you’ve never hiked 2600 miles, or 500 miles, how can you relate? Even for me, it sounds weird. What you need to understand is that it IS weird to think in these terms. And like last year’s PCT NOBO, I both look forward to being done with the hard daily work of walking 10-12 hours and hate for the journey to end. A few weeks ago, an old guy I met a few days earlier base camping and hiking near Rae Lakes told Puff Puff, not me, on their second encounter on the trail, that I was a goddess. I treasure that. People are impressed by us long distance hikers and truly they should be. I am impressed too but I don’t think I am particularly exceptional in being able to do this thing, there are a lot of us! If you find yourself inspired, give it a chance, discover if you’re capable, don’t say, “I could never do that,” just go out there and try. Enjoy your last 500 miles! You do inspire me! Not sure when or how but I do plan a long journey sometime! Happy trail to you! Thanks for the blog. It’s made me realize I don’t really want to hike all of the PCT, just the part 500 miles from Mexico north, haha!